Shortly after rumors about Spider-Man: Far From Home‘s possible inclusion of Hydro-Man surface comes a new rumor suggesting that the web-head will fight Molten Man, another supervillain in addition to Mysterio and the Chameleon. MCU Cosmic has apparently come across some information tied to the marketing of the film – specifically, the LEGO sets, one of which features a Molten Man minifig. They speculate that each of the cities in Europe that Spider-Man visits will have its own supervillain for the hero to fight – including London, Prague, Venice, and possibly even Berlin. The scenes involving Hydro-Man (who’s basically the Sandman but with water-based powers) are set in Venice, so that would leave a handful of other locations open for the Molten Man (a man with near-invulnerable skin and heat-based powers), Chameleon (a master of disguise who serves as a perfect spy), and Mysterio (who is talented in casting illusions and even some magic) to challenge Spidey in. Worth noting is that LEGO tie-ins aren’t always indicative of the final product, as evidenced by LEGO Iron Man 3‘s so-called “Ultimate Showdown” between the hero and the Mandarin, which anyone who has seen the movie can tell you didn’t happen due to that movie’s plot twist of having the Mandarin himself be a washed-up actor playing a part. With that in mind, the Mandarin was indeed in the movie, and having a fake fight between him and Iron Man would make more sense from a marketing standpoint than to sell a “Tony Stark VS Trevor Slattery” picture. There’s a chance that the Molten Man might just be an addition to help sell more toy sets, but it’s more likely that he plays a role in the movie, however large or small. 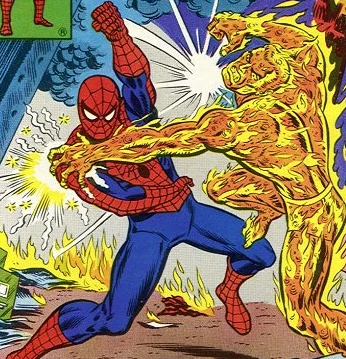 One factor that would suggest the Molten Man will be included in the movie is the rumored presence of Spencer Smythe in the movie, as the character is villainous scientist associated with the Molten Man’s origin. From the sound of things, Smythe will likely be a “background” villain in the same sense that the Tinkerer was in Spider-Man: Homecoming, albeit one who could have a comparatively larger role in the plot. In any case, it seems like there will be enough villains between Homecoming and Far From Home that a third Spider-Man movie should have no shortage of options to choose from when coming up with a Sinister Six team for the web-head to face off against.